An uneven memoir by the mother of Amadou Diallo, the young man who, in 1999, was shot 41 times by New York City police officers outside his apartment building. Kadiatou Diallo was born in 1959 in Guinea. Although her family was Muslim, she was allowed to go to school and to study the Koran. At age 13, she was married to Saikou Diallo, a 29-year-old entrepreneur/trader, who already had one wife. They moved to Liberia, and, at 16, Kadiatou had her first child, a son she named Amadou. While the marriage experienced rocky moments, Saikou built an impressive import/export business traveling all over Africa, Europe, and Asia. Other children soon followed, and Kadiatou joined Saikou in Togo, then returned to Guinea, finally relocating in Bangkok. The children were educated in private schools, were multilingual, cosmopolitan. By the 1990s, Kadiatou and Saikou had divorced (he had taken a third wife), and she had started her own export business in gems. Amadou decided to study computer science and go to America. The remainder of Amadou’s life is compressed into roughly 40 pages. He takes a job processing computer orders, lives with four other men in a small apartment in the Bronx, and applies for asylum in the US, falsely stating that he’s from Mauritania and escaping persecution. In 1999, Amadou changes jobs to that of street vendor, and after returning home from work one evening, is shot 41 times in his apartment vestibule by undercover police officers. While the title indicates a focus on Amadou, there are so few details composing his life that the reader can’t form a clear picture of him. 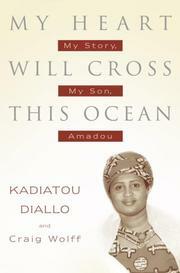 This is largely about Kadiatou, and yet she, too, remains an enigma. Her motivations are hazy, and the language is often opaque: “Even in the age of advanced untold knowing, I had no idea what was happening.” Not one character is vividly drawn, and the wildly different geographic locations all morph into one.